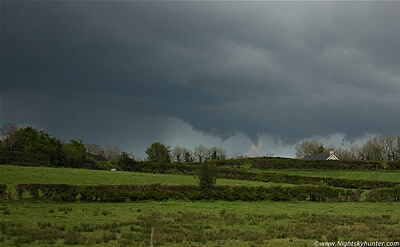 2012 was a roller coaster ride with several tornadoes and many funnel clouds reported over Ireland. The storm season began early with impressive storms and funnels near coastal regions then the activity moved inland during late Spring and early Summer making for an unusual and very action-packed season. Highlights for me where several funnels and one possible unconfirmed tornado in Antrim and the amazing multicell back-building storms during the same period. 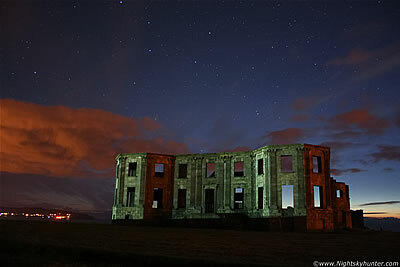 The year also includes day and night coastal shoots, moonlit storm cells, Venus & Jupiter conjunction, Portrush Airshow, moon halos and stunning aurora displays from the north coast including the Giant's Causeway and Mussenden Temple and climaxing with a two night aurora hunt with BBC television's 'The One Show'. 19 reports on here featuring the best images of the year. I hope you enjoy them as much as I did. Big report featuring my last two storm chases of 2012 on December 29th & New Year's Eve which I spent with Roisin at the north coast during stormy weather where we experienced several moonbows and an abundance of beautiful photogenic moonlit ocean storm cells and hail showers from Ballintoy and Downhill Beach. 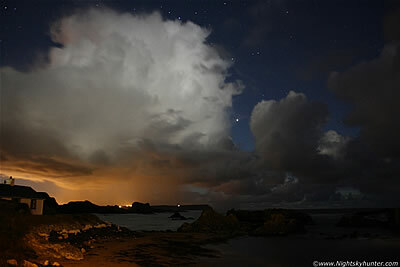 Report also includes a 2012 highlight slideshow covering all the year's best sky action. One page report with 27 images. - REPORT. Detailed report covering three night shoots at the Co. Antrim coast from November 20th to 23rd 2012 featuring a surprise faint aurora, a bright moon halo and encounter with a family of Seals with the highlight being two days and nights of filming with the BBC's The One Show crew at Ballintoy Harbour where Hannah Hoare, Marty Jopson, Michael Quinn, David Kilpatrick and I battled with cold weather and lack of sleep to catch an aurora display over the ocean on a magical moonlit night. One page report with 20 images and 1 video clip. - REPORT. 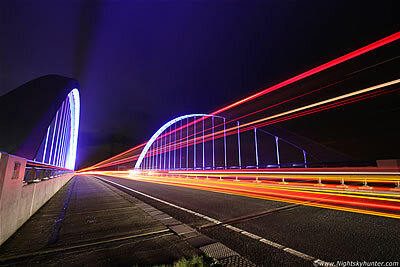 Short image report documenting a fun photo shoot of the famous Toome bridge at night complete with car trails on November 6th 2012 using the phenomenal Canon 10-22mm ultra wide angle lens which I currently have on loan from my Dad. My shortest report to date however it may be of interest to those who wish to pursue car trail photography or who are considering purchasing an ultra wide angle lens for their crop sensor DSLR. One page report with 3 images. - REPORT. On October 8th 2012 a CME and solar wind stream impacted Earth's magnetic field generating a KP6 long duration G2 geomagnetic storm with mid latitudes on red alert. 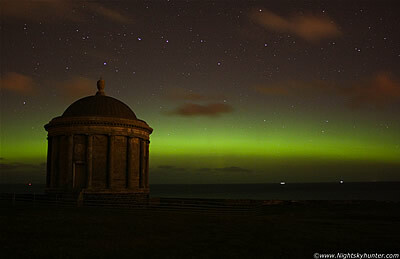 After a brief battle with clouds my girlfriend and I drove to the north coast where we watched a vivid green aurora band with several ray producing outbursts over the famous Mussenden Temple, Downhill Estate, and Downhill Beach in Co. Derry. One page report with 16 images. - REPORT. On October 3rd 2012 after feeling fed up from being house bound by a flu I decided to go out on a much needed night time photo shoot to Ballintoy Harbour on the Co. Antrim coast where I got treated to a beautiful night of moonlit convection, hail showers, stars over Roark's Cottage, and moonbows followed later by a rare sighting of eight Seals from Dunseverick Harbour on October 7th. One page report with 12 images. - REPORT. On Saturday September 8th 2012 my girlfriend and I spent a fun day at the Portrush International Airshow at the Co. Antrim coast. 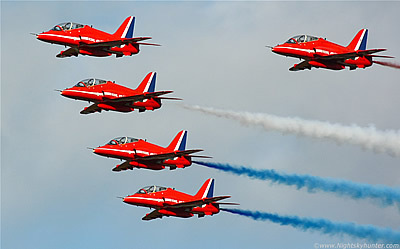 The photographic highlights included a Royal Marine Commando beach assault and The Red Arrows which looked stunning against the late afternoon blue sky before their display was cancelled due to technical issues. 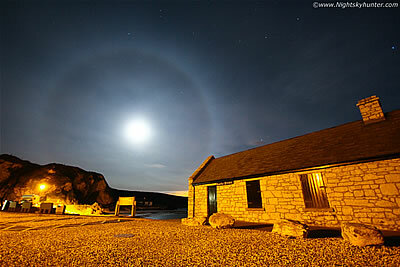 This was followed by a beautiful ocean sunset at Portballintrae and a faint aurora display. One page report with 19 images. - REPORT. Detailed report documenting several storm chases between Aug 16th and 21st 2012 from severe thunderstorms with great structure and epic updraughts including supercell characteristics sporting constant thunder over Antrim to a beautiful sunset over Belfast followed by more severe thunderstorms and a significant funnel cloud/possible tornado over Co. Antrim and ending with a line of majestic storm cells across the dusk skyline. One page report with 29 images and 2 video clips. - REPORT. 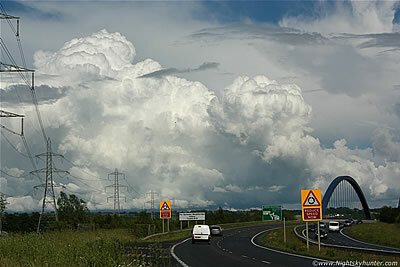 August 4th 2012 brought widespread thunderstorms across the UK however in N. Ireland what looked to be a promising day was suddenly handicapped by a strong capping inversion which stopped storm formation. During the late afternoon the cap suddenly broke producing several late thunderstorms across the country. This report features images of a photogenic explosive cell near Maghera which developed within min's producing a rare high based funnel cloud. One page report with 7 images. - REPORT. Extensive report featuring a complex atmospheric optics display around the sun with complete parhelic circle at Portballintrae on July 25th followed by June 2nd early season Noctilucent Cloud images however the main feature of this update is focused on a dramatic and photogenic thunderstorm cluster which passed over the golden sunlit wheat fields in the Maghera countryside on July 30th. One page report with 13 images and 2 video clips. - REPORT. Detailed report covering three days and nights of sky photography from storm chasing on July 11th in the Cookstown/Desertmartin area to the north coast Peace Camp installation as part of the London 2012 Festival on July 19th at White Park Bay beach and ending with a night time photo shoot of Mussenden Temple and Downhill Estate on July 21st with stars and Milky Way which made for a memorable Summer night. One page report with 14 images and 1 video clip. - REPORT. 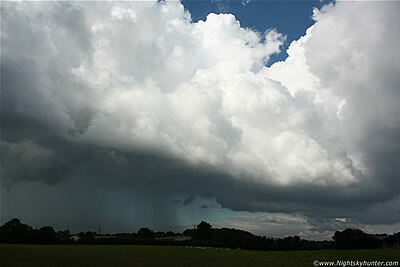 Extensive account covering a significant two day outbreak of mulitcell thunderstorms which caused severe flooding over Co. Antrim on June 27th followed by a 8+ hour storm chase on June 28th with Omagh chaser Paul Martin documenting a fun day's weather action in the Mid-Ulster area which resulted in several good storm intercepts at Lough Neagh from Ballyronan Marina and the surrounding area. One page report with 14 images and 1 video clip. - REPORT. 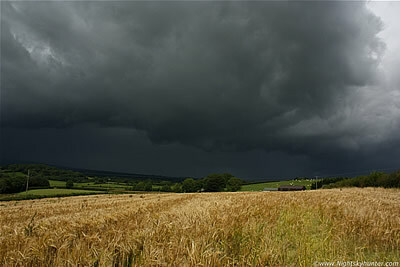 June 6th 2012 was an ideal chase day with 1000 CAPE, LIs of -3 in a post frontal air mass with slack SWly flow. 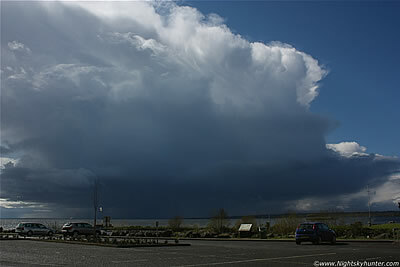 I chased twice this day, the first during the early afternoon when I spotted towering cumulus which directed me to a dry cell which produced a small funnel cloud directly over Lough Neagh observed from Ballyronan Marina which appeared on three occasions during a half hour period. This was followed by several intercepts during the afternoon in the local countryside and another late evening chase to the lough once again in pursuit of southern cells. One page report with 10 images and 1 video clip. - REPORT. 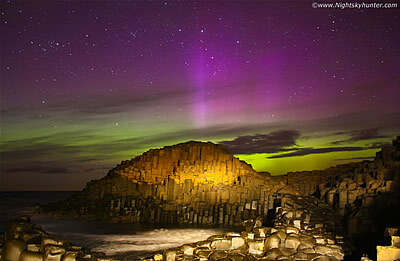 A truly epic night on April 23rd/24th 2012 spent at the Co. Antrim coast where Roisin and I watched a jaw-dropping KP6 geomagnetic storm which generated an intense outbursting long duration aurora display which we observed from the legendary Giant's Causeway and from the magical Ballintoy Harbour. The aurora produced multicoloured vertical beams over 60 degrees high and could be seen reflecting on the ocean while exhibiting breathtaking flaming forms of rapid speed which words fail to describe. One page report with 14 images. - REPORT. Friday the 13th 2012 began wet, cloudy, and cold, there was no convective forecast issued and with only 200 CAPE and positive LIs it looked to be just a cold day with showers. However all that changed during the late afternoon when my girlfriend and I went for a walk in the countryside where we encountered a line of developing towering cumulus clouds which suddenly produced an obvious dark funnel cloud over the sunlit fields which we could see rotating for 10 min's in duration. 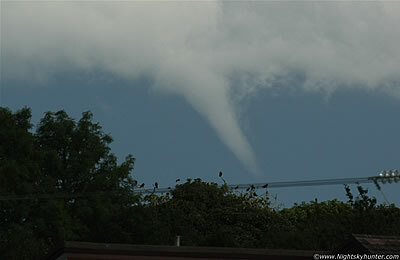 The funnel itself was almost 10 miles away and located near Kilrea. So much for bad luck on Friday the 13th!. One page report with 7 images. - REPORT. Documenting three days of storm chasing with attention focused on April 11th 2012 when by chance we intercepted two massive storm cells crossing Lough Neagh as seen from Antrim Marina. These cells had solid anvils almost the size of the Lough itself some 20 miles in length making for the largest cells I have ever seen for the month of April so far, these where observed as a significant sight even from 50 miles away. The climax was an explosive updraught over the Marina which looked like the plume from a volcanic eruption which made for a very exciting and photogenic day. One page report with 14 images and 1 video clip. - REPORT. Detailed image report covering three days and nights of photography at the Co. Antrim coast documenting the Moon-Venus-Jupiter triple conjunction and climaxing on March 27th with a spectacular night in the company of Paul Martin watching a surprise aurora display over the ancient rock formations in the ocean between Ballintoy Harbour and White Park Bay beach where we watched an aurora for over six hours which produced two outbursts with beams reaching 50 degrees high making this a truly unforgettable night. This was the best aurora I had seen since 2005. One page report with 13 images and a image slideshow. - REPORT. 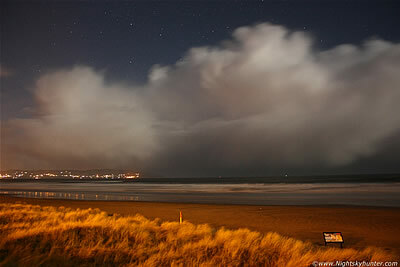 St. Patrick's evening March 17th 2012. 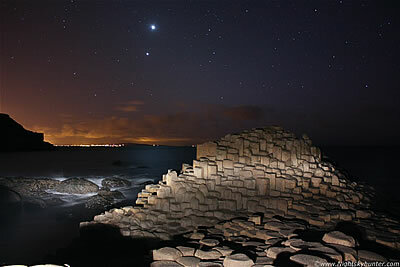 My girlfriend and I spent a magical night at the famous Giant's Causeway at the Co. Antrim coast under a pitch black sky where we enjoyed the wonderful glow of the Zodiacal Light along with the stunning Venus-Jupiter conjunction with their glitter path cast across the ocean surface followed by the faintest aurora I had ever seen. These phenomena viewed above the legendary 60 million year old rocks made for an experience never to be forgotten. One page report with 6 images. - REPORT. 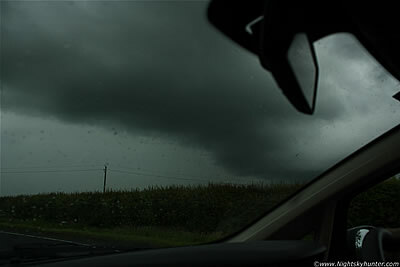 February 18th 2012 was my birthday so I celebrated in style by going on a local storm chase with my girlfriend across the high ground of Glenshane Pass to take advantage of an early season unstable post frontal air mass with weak inland CAPE. 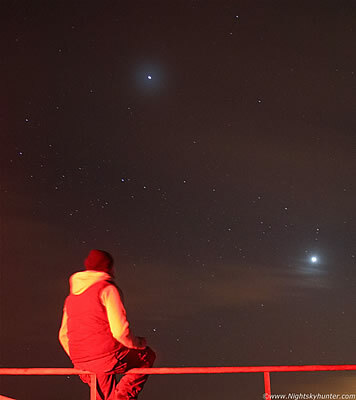 We spent the day chasing hail and snow showers followed by a late evening shoot of a beautiful conjunction between planets Venus and Jupiter followed by a late night surprise aurora display which kept me busy until 04.00 the following morning making for a fun and action-packed birthday. One page report with 13 images and 1 video clip. - REPORT. On January 19th 2012 sunspot 1401 unleashed a strong solar flare and large CME which was heading directly towards Earth. 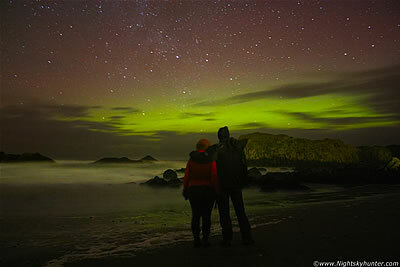 This report documents two nights of aurora chasing with my girlfriend to the Co. Antrim coast hunting for the aurora borealis. 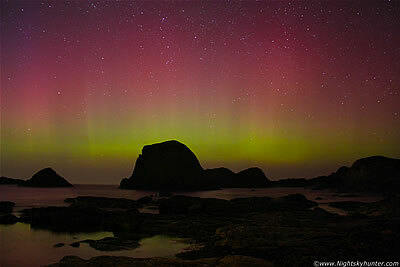 The 48 hour watch was a success with auroras observed on both nights, however the night of Jan 22nd produced the best show of the weekend with a vivid green aurora display glowing over the sea which we watched from the famous coastline at Ballintoy Harbour. One page report with 9 images. - REPORT.